I don’t get these Powerade bottles. They have a ‘security strip’ to hold the lid in place (see strips next to bottle in photo) to make it harder for people to open them. I mean if you’ve been working out and are thirsty, the last thing you want is to ‘waste time’ opening a bottle of Powerade! You want to quench your thirst. This new lid design is not making easier for me to do that. 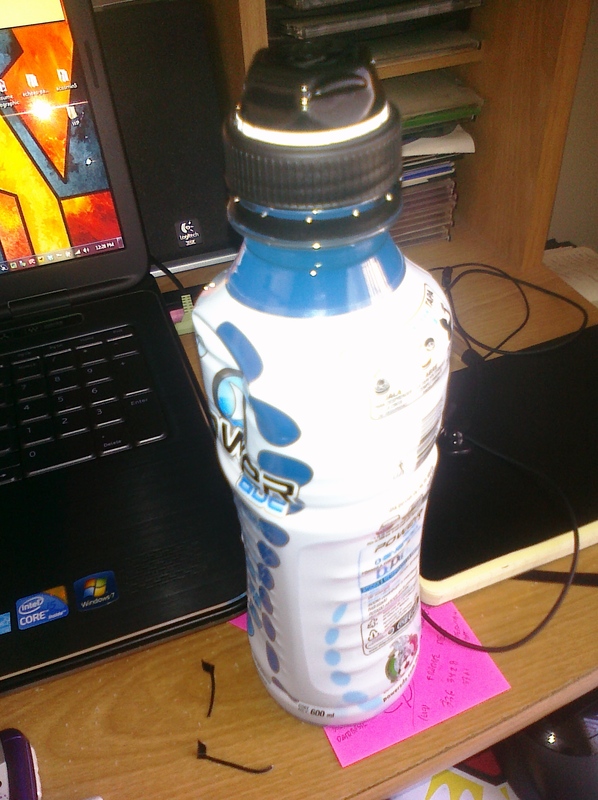 The lid becomes an obstacle in towards my goal, to quench my thirst. It’s not intuitive either. I’m not one to read instructions (Which it has on the side. When did we need instructions to open a bottle?!) so it probably took me 30 seconds to a minute to figure out the security strip and then finally open this thing. Makes me think they never market tested these new bottles. It also makes me think they don’t know who their customer is, athletes. Great design takes into account a users desired outcome and then removing obstacles from their path in achieving that outcome. If we wanted to ‘make it harder’ (a pain) for people to quench their thirst, Powerade did a great job at doing exactly that. Tagged breakthroughs, co creation, Creativity, disruption, Innovation, steve jobs. Before I fell in love with technology my intent was to become an architect. Because of this I have an acute sensitivity with architects, so when I heard about the ideas of Bjarke Ingels a few years ago I was blown away. When we think about innovation we talk about thinking outside the box so we can replace the existing box. But in doing so we sometimes completely forget about using the constraints of the existing box for inspiration. Thinking outside the box is just looking for solutions in other boxes and integrating/combining those ideas into the existing box to make a different and better box. Watch these series of videos and notice how many times Bjarke works with contraints to create something revolutionary while not even attempting to do so. Key point: Constraints help you focus on what matters. Then you can look beyond them in other boxes to see how you can re-arrange, re-imagine you existing box. When we consider ‘how aha really happens‘ the traditional method we use for generating creative ideas, brainstorming, has flaws. Ask your friends, when do they have their best ideas? They will seldom answer, ‘during a brainstorming session’. Most likely it was in the shower, while driving and stuck in traffic or while daydreaming. The fact of the matter is ‘we can’t schedule creativity’ because we don’t know when that ‘aha’ will strike. Yet despite this basic human process we find that managers schedule a specific time for teams to come up with creative ideas. For example, in brainstorming sessions several people can quickly dominate a conversation often restricting the sharing of all potential ideas. In other cases, individuals may think less critically about a problem because they are happy to let others do the heavy lifting. And, those people who lack confidence or internal credibility are more likely to practice self-censorship within peer groups. Finally, groups can be a breeding-ground for organizational barriers such as cultural norms and management bias that limit creativity and critical thinking. I think a better way of brainstorming is doing the opposite of typical brainstorming. For example, instead of brainstorming in groups to solve a particular problem at a particular time, setup a weekly meeting and let people bring in ideas on any subject that strike them at any time during the week. Interesting right? Also in a traditional brainstorming session the group picks out the idea right there. Instead, don’t decide right away. Because if you brought an idea on any topic at all, the rest of the group might not have thought about the topic before. They’ll greet you with a blank stare in their face. So instead of evaluating your idea the group will ask you to explain the idea as best you can, including all the elements that you combined in your head to come up with the idea. Then everyone goes off and think about individually and the discussion can continue over emails, telephone or in person. Eventually, a promising idea might emerge from the pack. At that time, it’s time for the ‘What Works Matrix‘ as an individual or group exercise. Bottom line is creating the element of surprise at the beginning of idea generation. Because if you don’t create surprises you aren’t innovating. Now that you know how creativity works in the brain, the point is that our brains make connections continuously without us being aware of it. And because this is a natural human process, it’s key that we take advantage of in a whole week or month and not just in a two hour session. Now, new research suggests that this hybrid model of brainstorming is more effective than the traditional one. While the research may be new, the practice is not. Firms such as IDEO have been doing this for years. They’re well known for including people from diverse backgrounds in all their meetings, essentially preparing a cocktail mix of ingredients to generate creative ideas. This is how creativity works in the brain. Personally, I practice this model of brainstorming myself but have encountered problems. For example, if you’re the only one who brainstorms this way you’ll end up generating ideas that make no sense to others. They’ll think you’re nuts but at the same time they’ll give you the benefit of the doubt since you seem to have all the cool non-conventional ideas. Another problem is that people are used to brainstorming and selecting an idea right there. They don’t want to give an idea time to ‘simmer’ in their brains because of the bias for action. And also because they have more ‘important’ things to do in their routines and supposedly have no time to think. Blah! 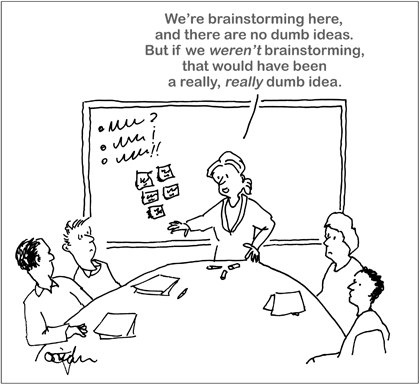 Well you have to get people on board in the new way of brainstorming. My recommendation is ‘educate’ your team on how creativity works in our brains so they become aware of their own tendencies. This isn’t necessarily going to eliminate all obstacles but it’s an effective way to get people to believe, and as a plus they’ll feel smarter. Thoughts? Do you practice a version of reverse brainstorming? Tagged Brainstorm, brainstorming, creative idea generation, Creativity, IDEO, Knowledge Creation, psychology.